It’s that time of year again! Pull up a pew and pour yourself a cuppa ready to watch a select group of amateur bakers slog it out on Britain’s favourite baking show. That’s right, the Great British Bake Off is back! As the hopeful contestants frantically mix, bake and decorate in a bid to wow the judges with signature, technical and showstopper bakes, like many of us, you might find yourself inspired to roll up your sleeves and put on your pinny. Look no further than wilko for all the things you need to create a home-made bake off of your own. For all the baking must-haves, check out our baking section online! Whether you’re whipping up a cake, a pie or your dessert of choice you’ll find everything from rolling pins and measuring cups to pie dishes, flour shakers and icing sets. Unlike standard cooking, baking requires precise measuring and weighing. You can’t go throwing in a bit of this and a bit of that, so unless you’re a real pro in the kitchen, you’re going to need some kitchen scales. For super fast, professional results, choose from our range of mixers. From standard to top of the range, you’ll have no trouble mixing up a sweet treat. Channel that inner Mary Berry! There’s nothing better than baking in an organised kitchen. 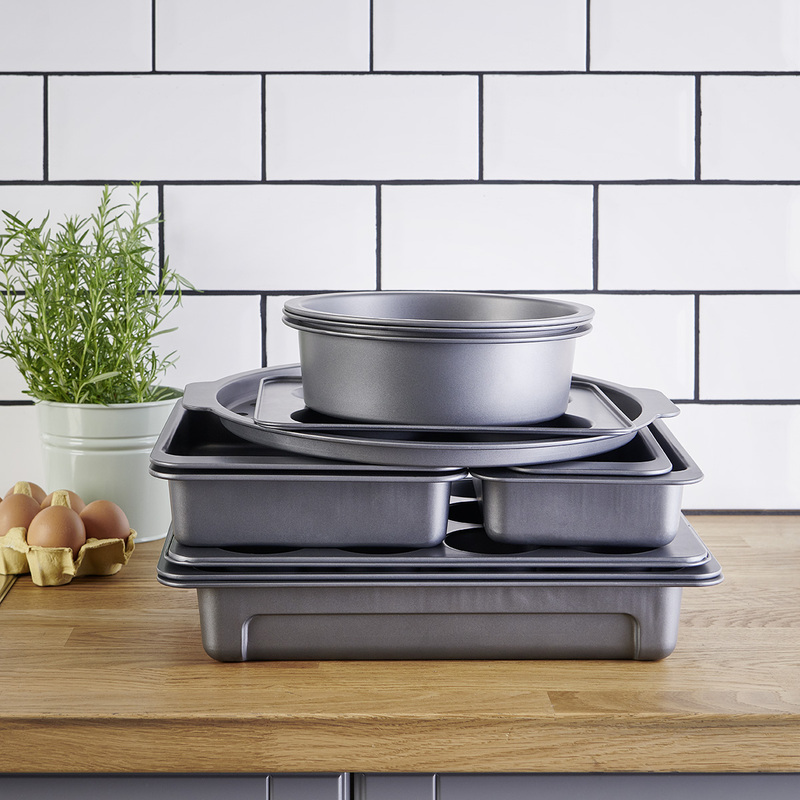 Our new stackable bakeware is perfect for getting the kitchen cupboard tidy and organised. We have stackable bakeware available in white and grey providing all you need for a brilliant bake. Our ceramic white ovenware includes a casserole dish, pie dish, roasting trays and mini ramekins that all nest inside one another to save on cupboard space. Our nestable and stackable kitchen ranges and easy to clean, dishwasher safe and built to last. If white isn’t your style, we have stackable grey ovenware including pizza trays, large roasters, muffin cups and oven trays that all stack and nest perfectly together. They’re available from the 15th October. See the video below to see how they stack up! Don’t forget to stock up on jars in every shape and size to decant all of your ingredients into. The on-trend Kilner jars look great in any kitchen setting, choose from twist top and clip top jars to keep your ingredients fresh and easily accessible. Why not have a family bake off of your own? We have some great tools that’ll keep little ones entertained and enthusiastic about baking, including cookie cutters and heart-shaped moulds. If there’s any hand mixing to be done, get the kids involved. But be warned, things are bound to get messy! OK, maybe the taste is the most important factor, but presentation counts for a lot. For the perfect place to display your marvellous creations, opt for a cake stand. And don’t forget the cake slice to complete the look.